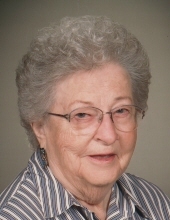 Beulah Lorraine (Shaffer) McDaniel died March 30, 2019, at the Clarence Senior Living Center at the age of 94 years. Visitation will be held Friday, April 5th from 5-7 p.m. at Chapman’s Funeral Home in Clarence, Iowa; services Saturday April 6th at 11:30 a.m. with Shepherd Karmen Jamison, also at Chapman’s. Beulah was born on a farm in Jasper County, Iowa, March 20, 1925 to John and Rachel (Brown) Shaffer. She enjoyed the rural life, playing along the river, riding ponies, having a pet goat and many other animals. Her family endured the Great Depression and she graduated from Monroe High School during WWII. It was there she met and later married Ray McDaniel. As the story goes, he was home on leave from the Navy and proposed with “marry me now or never” and so they did on January 5, 1945. (Who could resist that proposal?) They started out their married life in Newton. Eventually, Ray’s new job took them to Clarence. On the way, after driving for what must have seemed like an eternity with (then) three kids in tow, Beulah turned to Ray and said, “Where in the heck are you taking me?”. But they settled in nicely at Clarence and it quickly became their home. Beulah was a consummate homemaker. One thing she will always be remembered for were her fabulous meals and baking skills. She was also very talented and creative and she enjoyed painting, quilting, cake decorating, knitting and sewing. Beulah was an avid card and bingo player and in her later years, could be found coloring and working puzzles. She could identify most types of birds and she loved watching them at her feeders. But most importantly of all, her life was always first and foremost centered on her family. Beulah is survived by her four children: Ron McDaniel of Marion, Sandra Meyer of Clarence, Linda Morrison of DeWitt and Edwina (Mark) McLees of Fairfax; eight grandchildren and nine great-grandchildren, plus many beloved nieces, nephews, cousins and wonderful friends. Preceding her in death were her husband, son in law Douglas Meyer, grandson Joshua Morrison, brothers Clifton, Lawrence and Melvin Shaffer and sisters Leona Pearl Baker, Opal Patterson and Helen DeHaai. Beulah was a member of the Clarence United Methodist Church, a 50 year member of the Clarence Legion Auxiliary , The Order of the Eastern Star and the UMW Quilting Circle. To plant a tree in memory of Beulah L. McDaniel, please visit our Tribute Store. "Email Address" would like to share the life celebration of Beulah L. McDaniel. Click on the "link" to go to share a favorite memory or leave a condolence message for the family.